YEAR OF THE DOG Fundraiser – Abandoned Animals Inc.
We brought in 72 dine-in customers on Thursday Night. 15 take-out orders also presented our flier. We registered just under $2,000 in sales which translated into $387 (20%) for the Animal Shelter Gift Fund. We took in another $216 in donations & raffle proceeds. Our total take for the event was $603. 2, present our event flier with your payment. 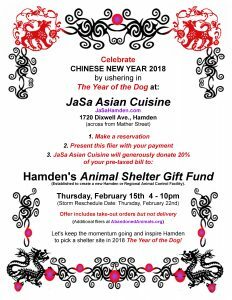 3, JaSa will donate 20% of your pre-taxed bill to Hamden’s Animal Shelter Gift Fund. Exclusions: Offer includes dine-in and take-out orders only. Not valid on delivery orders.